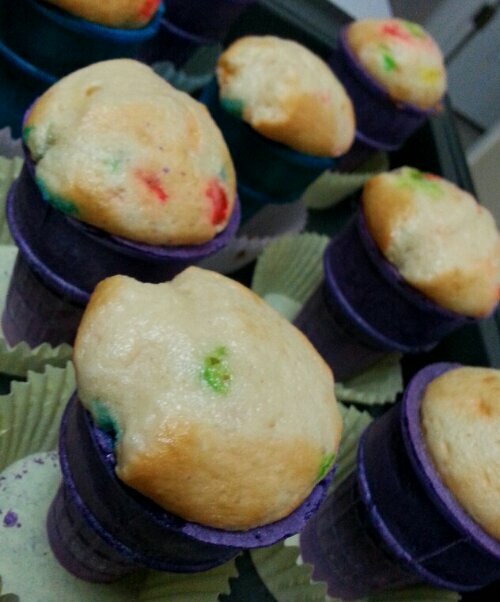 Why make cupcakes/muffins in a boring cupcake pan. Mix it up and use ice cream cones instead! The result is just adorably delicious! Of course you can decorate them! Decorate them the way you want with the flavor you want the way you want. Don’t be shy and let your imagination run wild! Get your favorite cake mix; either from scratch or a box; follow instructions from the box or your own recipe. Then get some ice cream cones. Fill up about half of the ice cream cone with the cake batter. Follow instructions on the box or your recipe for oven temperature. Place ice cream cone filled with batter into the oven for said amount of time on the box or your recipe. Then decorate them the way you like or leave them the way they are.